Diary: Institutional Act 5. It's not over yet. Institutional Act 5. It's not over yet. This is the name of the exhibition: “A1-5: 50 anos. Ainde não terminou de acabar”. It commemorates the fiftieth anniversary of the so-called “Fifth Institutional Act” of the Brazilian military dictatorship. This effectively stripped every citizen of Brazil of every human right. And it imposed the strictest censorship on artists of every kind. The title also says: “It’s not over yet”. It’s an amazing, beautiful and powerful exhibition at the Instituto Tomie Ohtake, one of the most important art galleries in São Paulo. Among the artworks and the pictures of protests and happenings are extraordinary moving testimonies from the artists who were active at that time and are now recognised as some of the important Brazilian artists of the 20th century. Stories of struggling to survive under the threat of imprisonment, of torture, and of worse. Of artworks created with love and passion that have since been destroyed. And among all these extraordinary and powerful artworks and testimonies is a simple wooden altar, that can be folded up and taken on tour. It is covered with a cloth embroidered with a representation of love. With a chalice of wine. With flowers in a vase. With a beautifully printed and bound book in English and in Portuguese. Beside it are two documents side by side. One banning the play as being deeply offensive to religion; and one stating that any such ban is contrary to the constitution. And beside it is a list of all the performances of the play in Brazil over the two years of continuous touring, the injunctions that have banned it and been subsequently overturned. 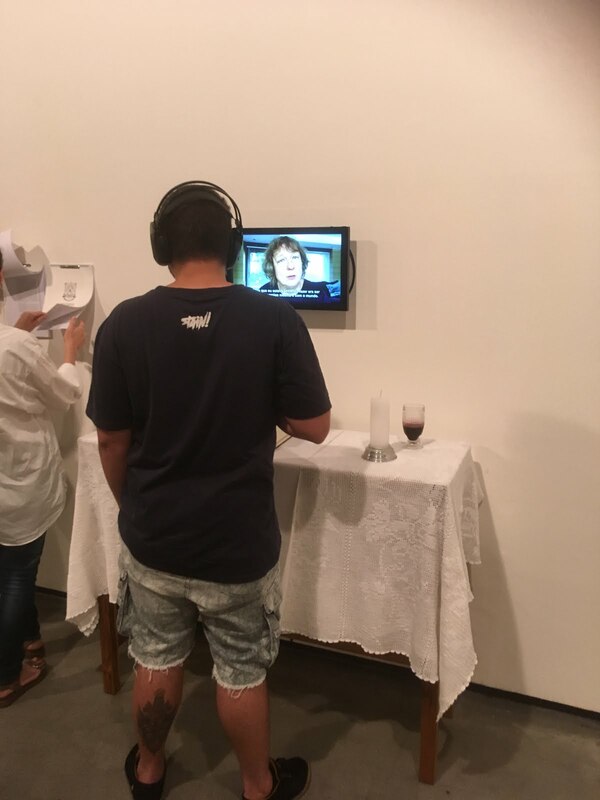 And above the altar is a screen with footage of the actress Renata Carvalho performing a scene of the play with the most astonishing and beautiful grace and authority, and of the armed police disrupting its performance in Garanhuns but failing to prevent it. And Renata performing the final scene, lit only by a flashlight, to an audience standing rapt under torrential rain. And this is about my play. “The Gospel According to Jesus Queen of Heaven”. And there, giving my testimony on screen. among all these other courageous and remarkable artists, is me. It makes me cry to think of it. And my first thought is that I don’t deserve to be here. Renata, yes, and Natalia Mallo, the translator and director, yes, and all the other beautiful artists from the company who present the play in Brazil and who risk life and limb and defy threats of torture and of death to do so. But not me, who perform the play in safety and comfort back home. And then I look back to 1968, the year of the Institutional Act, the year revolution was sweeping the streets of Europe, when I was eighteen and so longed to be part of it. But was paralysed in fear and did not dare. In any case that revolution had nothing to say about gay rights, as I remember, and certainly nothing about trans rights. Because in those years trans rights did not exist. The word “trans” did not exist. I had no words to describe myself. No framework of thought in which to reflect about myself. I thought of myself as something unspeakable. As someone despicable and perverted and vile. There was no need of generals or prisons or torturers to keep me silent. My upbringing had put them all in my head. And sealed my heart in the deepest shame. The process was so through I was not even aware of it. I had internalised my oppression so thoroughly that when I read its visionary analysis in Frantz Fanon I did not realise it applied to me. I thought if I was unhappy it was because I was sick and deserved to be. And if I ask myself what saved me from an early death from suicide or alcoholism or AIDS it was the love of my partner Susie, the love of our daughters and my obstinate conviction that I was an artist. And if I think of myself resisting all that oppression and suffering and finding my voice in spite of it, and learning to love and be loved in spite of it. I think Yes. Ok Yes. Yes I deserve to be here.